The Squaws placed 5th at the Farwell tournament last weekend. On Thursday they lost to Anton 36-63. Anton outscored the Squaws 35-13 in the second half. Scoring for Friona: Hicks 9, Miller 8, Murphree 6, Strohmayer 5, Preston 4, Posada 2, Juarez 2. Friday’s game was with Christ the King and the Squaws won 68-28. They led 41-18 at the half. Scoring were: Murphree 21, Miller 12, Hicks 11, Strohmayer 6, Juarez 5, Preston 3, Adame 2. In Saturday’s game the Squaws beat Grady 56-22. They led 15-6 at the end of the first quarter and 32-6 at the half. Scoring were: Miller 13, Strohmayer 10, Hicks 10, Kimbrough 7, Murphree 6, Juarez 4, Adame 4. 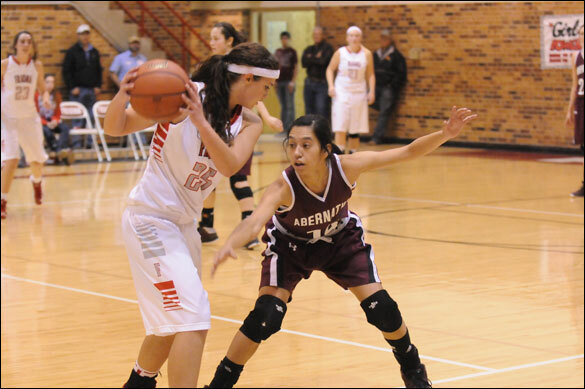 Brianna Miller (25) plays keep away with an Abernathy Lady Lope Tuesday night at Friona gym. The Squaws won the district opener 51-43 and travel to Muleshoe Friday Dec 14 for a district match with the Lady Mules.